Next we use the formula to extrapolate a gold price forecast. 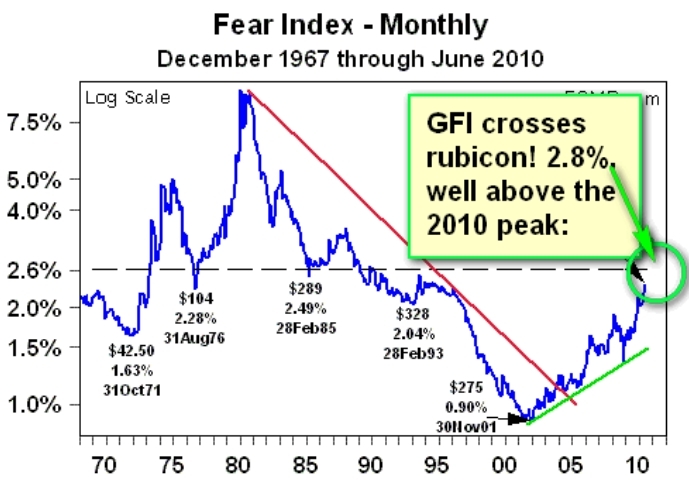 The chart shows the Fear Index apogee of roughly 9% in 1980. 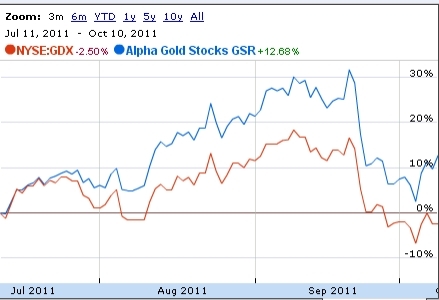 So we plug in a new gold price of $5,000 which results in 9% GFI reading. The GFI index can be used to determine the fair value of silver, by simply using the gold/silver ratio. Assuming a GFI figure of $5,000 and a gold/silver ratio of 50, the expected silver price is: $5,000 / 50 = $100. However, to derive a more accurate silver estimation, we apply the GFI formula to the silver market, resulting with a new indicator: the silver fear index (SFI). Since the government has sold off the strategic silver stockpile, all three billion ounces and the US Mint must purchase silver from the free market, the silver market balance figures produced by the CPM Group are used. This figure represents the annual silver inventories. First we calculate the SFI for the 1980's peak price of $50 to use as a base for common size measurement: .54%. Next we calculate the current SFI: .04%. Clearly the silver price is EXTREMELY undervalued relative to 1980. But precisely how undervalued is silver, relative to the 1980's peak? So investors should expect silver to climb to $108 and gold to $5,398 per ounce. Although the numbers listed above are close approximations, for a more accurate calculation of the gold and silver fair value estimates, the GFI and SFI formulas must be combined within the original M3 money supply computation. This article is dynamic - the formulas will be updated after this semester is over. Please click this link for the Housing Fear Index (HFI): click here. PLEASE READ CAREFULLY - Disclaimer: Information provided must not be construed as a recommendation to buy or sell any security or financial instrument, or to participate in any particular trading or investment strategy. The author / editor of this web site has not been paid by any company or service to promote the stock picks. All stocks are chosen entirely due to technical / fundamental characteristics. Any action taken as a result of information, analysis, or advertisement is ultimately your responsibility. The host and author is not a paid adviser. Investing in high alpha stocks involves substantial risk. Past performance is no guarantee of future returns. Consult your investment adviser before making any investment decisions. Investors are advised to apply only a fraction of their total portfolio, less than 2% to the total of all picks. Only RISK CAPITAL should be used due to the high volatility associated with such investments. None of the stock information, data and company information presented herein constitutes a recommendation or a solicitation of any offer to buy or sell any securities. Information presented is general information that does not take into account your individual circumstances, financial situation, or needs, nor does it present a personalized recommendation to you. Individual stocks presented may not be ideal to your investing objectives. Although information has been obtained from and is based upon sources believed to be reliable, we do not guarantee its accuracy and the information may be incomplete or condensed. All opinions and estimates constitute judgments contingent upon the date of the report and are subject to change without notice. This report is for informational purposes only and is not intended as an offer or solicitation for the purchase or sale of a investment security. Past performance is no indication of future results.